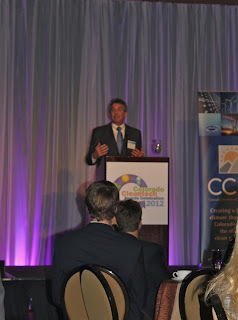 This Monday, we honored those endeavors of Colorado’s cleantech community during our Colorado Cleantech Leadership Awards Celebration. Throughout the evening, we honored 14 recipients for their efforts in advancing Colorado’s cleantech ecosystem, increasing jobs and driving innovation in the cleantech sector. Innovation was a theme for the night, as Josh Green, General Partner of Mohr Davidow Ventures, presented his compelling keynote on the importance of clean technology today and forward. Founded in February of 2011, the Center for the New Energy Economy is a privately-funded initiative to support the growth of a cleantech economy across the United States. The Center, a part of Colorado State University, is led by former Colorado Governor Bill Ritter and is assisted by some of the nation’s most important thought leaders in clean energy research, development and commercialization. Robert Fenwick-Smith founded Aravaipa, an efficiency-tech investment fund in Colorado, in early 2008. With 20 years of global experience acquiring, founding, building, merging and selling companies, Robert is frequently invited to serve on cleantech investing panels and juries. Wells Fargo offers customized commercial banking products and services to businesses that manufacture, market or develop clean technology products and services. It is with their generous support that programs such as the Cleantech Open, CU Cleantech, NREL Industry Growth Forum, and Cleantech Fellows Institute that cleantech ventures in Colorado can sustain funding. 9th Street is a non-traditional venture capital group born out of CoorsTek, Inc, headquartered in Golden. 9th Street primarily focuses on businesses in the advanced materials sector and has invested in Boulder Ionics, ALeco Container and more. Based in Boulder, Colo., Albeo designs and manufactures highly efficient LED lighting solutions focusing on the commercial and industrial sectors. Albeo’s primary goal is to enable businesses to simultaneously lower their total operating costs and help the environment. Boulder Wind Power creates utility-scale permanent magnet generator technology that will dramatically reduce the production cost of wind energy. The company works with wind turbine manufacturers to deliver simpler, more efficient and cost-effective ways to maintain systems than existing wind turbine technologies. SkyFuel, Inc. is a solar thermal power technology and service provider founded in 2007. SkyFuel solar collectors harness solar radiation to produce steam for electricity generation and industrial applications. The company is a leading supplier of utility-scale concentrating solar power (CSP) systems. Mueller is the founder of EcoVapor Recovery Systems, a state-of-the-art recovery technology for oil and gas wells. He has established an industry-leading economic return technology that also addresses increased environmental regulations. Mark Verheyen joined the TerraLUX team in 2011 with extensive experience in the illumination market and a proven track record penetrating and expanding new growth markets across Asia/China, South America, North America, and Europe. Mark has more than 20 years of sales and senior management experience. Brian DelGrosso is a member of the Colorado General Assembly representing the Loveland area. Brian is a successful small business owner and a pragmatic legislator with a reputation for common sense solutions to grow Colorado’s economy. Additionally, this year he was the sponsor of a bill signed into law to cut red tape to make it easier to expand alternative fuel vehicle infrastructure.